She fell from heaven... but now she's back. In the stunning sequel to Fallen to Grace, Azrael must face a new world with new masters. She's the Queen of Celestia--or so the Council of angels wish her to believe. The Seraphim, the true ruler of Celestia, holds Gabriel captive and tinkers with dark magic. Azrael must master her powers and her heart like never before in order to save Gabriel and lead a coup against the Seraphim. She'll find an unlikely ally in a mutated girl who once took everything from her... Will it be in Azrael's power to forgive? I enjoyed book 1 of the Celestial Downfall series and book 2 Rise to Hope is even better than the first one. This unique world is different than most books written about Angels & Demons. Here angels are not always good and demons are not always bad. Narration was good and brought the story to life. You could probably read book two without having read Fallen from Grace but I would suggest starting with book 1 to understand some of the references to the first book. It is a unique world with a different take on Angels not always being good and a great heroine that has gone through so much to help both angels & hybrids. I’m looking forward to book 3. I was sent this audiobook for an honest review. This book was a great addition to this series. I enjoyed the first book and this one blew it away. The characters plot and writing r fantastic. My only complaint is I want more world building! As with the first book in this series, the author has an interesting take on angels/demons. This book picks up pretty much right where book 1 left off. I thought the narrator did a good job on this book too. All in all, a good listening experience. I'd be open to book 3 in the trilogy. The author has created a world where Angels are not all good and Demons are not all bad, and some have become a hybrid of the two. Sounds a lot like humans. Azrael recognizes the evil in herself, but has chosen to use it for good; to not let it control her. I don’t think you have to actually read book 1 of the trilogy before reading this one, but I’m sure it enriches this story. There are plenty of references to events in Fallen to Grace, so you can get Rise to Hope if you have the chance. I usually listen to audiobooks at 1.25 speed because they sound slo-mo, which is SO annoying, but I did have to slow this one to 1.00 speed to get the most out of the recording. By any chance, is the Alyssa Jewell listed as narrator the same as the author, AJ Flowers? Once again A. J. has written a non stop action filled angel and demon novel. 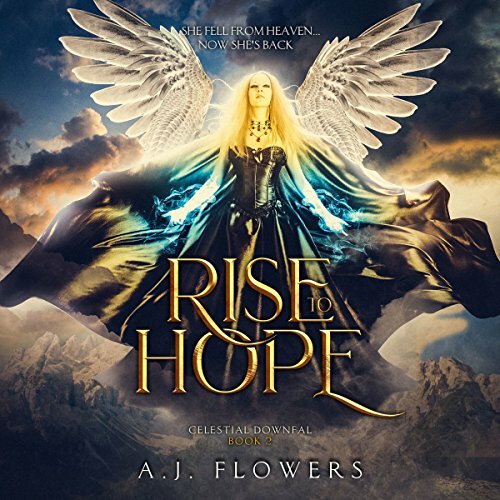 Rise to Hope is the second novel in the Celestial Downfall trilogy and the storyline picks up right where Fallen to Grace left off. Alyssa Jewell again did a wonderful job of narration, bringing life to all of the characters. A. J. may have to forgo any vacation time this year in an attempt to keep her readers happy by bringing book three to market.